Are you tired of being on land? Swap land for water and get down to the speedway. 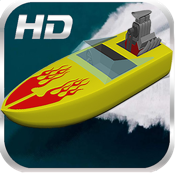 Race the speed boat down the river and tilt your phone left to right to steer the speed boat and swerve away from the boats. Make sure you don't hit them or you will be blown up! To really go fast tap the screen and watch the turbo boost blow you away.